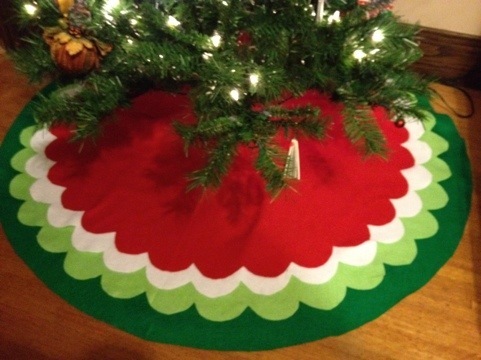 I love my new Christmas tree skirt! To start with I bought a yard and a half of three colors of felt and two yards of a fourth. I chose dark green for the bottom layer so I got the most of that color. I started with my top layer first. I folded my old Christmas tree skirt in quarters and then did the same with my red felt. 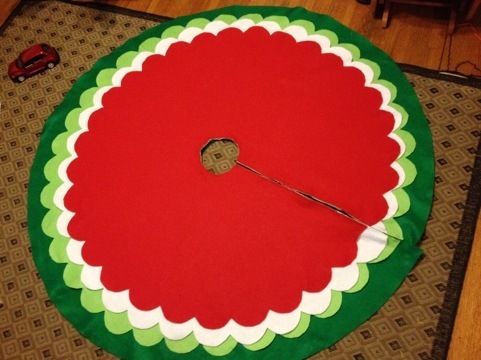 I lined them up and using my old tree skirt as my guide, I cut my red felt. I then folded my next layer of felt into quarters and using the red felt I’d just cut I cut my white felt about an inch and a half larger. I repeated this for my last two layers. To make my scalloped edges I used a CD as my guide and marked on my felt with a piece of chalk. You are bound to have two that don’t line up just right use this as the back of the skirt. I scalloped the top three layers and left the bottom layer straight. To make sure everything lined up when I was ready to cut my slit I made sure my awkward spot where the last scallop lines up with the first was on the fold line where the fabric had been folded over to wrap around the bolt. I folded my layers again into quarters and used my CD to cut a circle for the center. 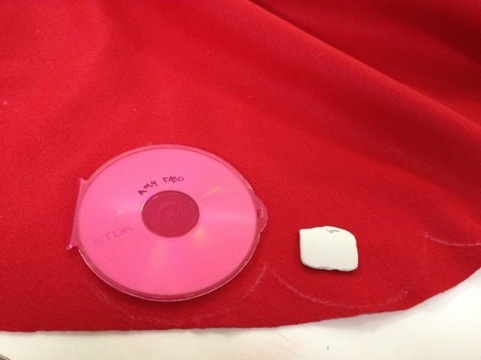 I lined the tip of my folded over felt to the hole in the CD to make sure all my layers had the same size hole. Then I unfolded the felt and cut my slit right on the fold line stopping at the middle. 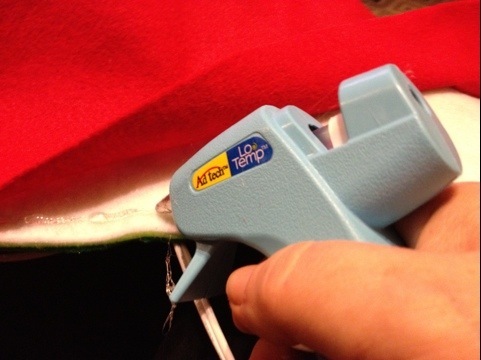 To attach the layers together I used a hot glue gun lining up each side of my slit and then the center I glued the edges together. My tree never looked so festive!